Mary Smith Cranch reported to ABIGAIL ADAMS details of the commencement exercises at Harvard, during which John Quincy Adams and Billy Cranch received their degrees, and the entertainment that followed. Every candidate for a degree had to give a commencement oration. 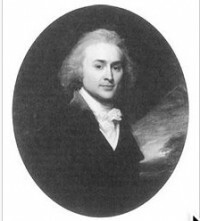 The title of John Quincy’s was “The Importance and Necessity of Publick Faith to the Well-Being of a Community.” Although he was much praised, JQ was miffed when the newspaper the Massachusetts Sentinel declared the oration of classmate Nathaniel Freeman superior to his. The party afterwards was quite a do. “We din’d above a hundred People & treated with cake & wine above four hundred”!!! We din’d above a hundred People & treated with cake & wine above four hundred I am very certain we were honour’d after Dinner with the company of His excellency the Governer & L—— Govr. & a number of the Senate—The Resident Professor & Tutors, who all came to congratulate us—In short I had enough to do to set & receive the congratulations of our Friends & acquaintance I most sincerly wish’d you with me to have taken your share—We were not only congratulated that we had a son & Nephew who had done themselves such Honour, that day but that they had sustain’d such amiable good characters during their residence at college—I had as much small Talk to do as their Majestys upon a presentation day—but they never felt half as much pleasure your sons all felt like my own & I presented them as my adopted ones till your return & proud enough I am of them. . . . The letter appears in Founding Families: Digital Editions of the Papers of the Winthrops and the Adamses, ed.C. James Taylor. Boston: Massachusetts Historical Society, 2016. Some information was taken from Woody Holton Abigail Adams (New York: Free Press, 2009), 245. 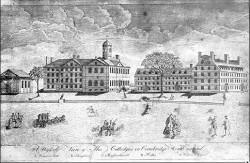 The engraving of Harvard in 1767 is by Paul Revere. MARY SMITH CRANCH wrote to her sister ABIGAIL ADAMS in England about preparations for the graduation from Harvard of John Quincy Adams and her son Billy Cranch. A huge celebration after the commencement exercises on July 17 is planned. Lots and lots of food! Such a shame that the Cranchs don’t have enough money to send Billy with JQA to study law. It is true we are doing but little but it makes us more work than Ten such entertainments at home. every thing is dress’d here, & to be cut cold at cambridge except Green Peas. we are allamoding Two rounds of Beef, Boiling four Hams of Bacon & six Tongues. They smell finely I assure you. this will be all our meat—cider Punch wine & Porter our drink: we have had our Tables & seats made here, nothing but Boards plain’d, making them hear will save us five or six-dollars we have Milk Bisket & plumb Cake to be eat with our Tea. Betsy Smith from Haverhill has been here some time. She & Lucy are gone to day mr JQ.A. & Billy also. tomorrow mr Cranch & I go. . . . Cousin JQA has lost . . . much Flesh . . . but he looks much better than he did in the spring he is going a journey to Haverhill after commencment. . . . I fear you do not use exercise enough any more than your eldest son— He will take a journey after the Bustle of commencment is over to Falmouth & then sit down to the study of the Law will mr Parsons. There will be a hard parting on Billys side at least. He wishes to study with his cousin but we cannot pay his Board & the demands of a Teacher also at least for a year or two the expence of the last year has been very great & yet Billy has been as prudent as a child could be, but I hope we shall get through it without injuring any one & that it will not be lost upon him. He has behav’d well & pass’d thro college without a censure Tomorrow he will compleat his eighteenth year—There is no time of Life exemted from temtations, but I have thought that there was none more critical for a Gentleman than from eithteen to twenty two. Passion is then the strongest & is too apt to prove an over match for Reason. . . .
adieu for the present I must go & pack to send another cart tomorrow one is gone to day. The letter is from Founding Families: Digital Editions of the Papers of the Winthrops and the Adamses, ed.C. James Taylor. Boston: Massachusetts Historical Society, 2016. Eartlier in 1787, before ABIGAIL ADAMS and John had set out on their tour of the West Country of England, Abigail wrote her sister Mary Cranch (July 16) complaining that John Quincy Adams and Mary’s son Billy, both due to graduate from Harvard, had not been writing regularly. No surprise to any mother, Abigail was worried about John Quincy’s health. She also expresses her concern over the political climate in the United States. [T]he account you give me of the Health of JQA, is no more than I expected to hear. I warnd him frequently before he left me, and have been writing him ever since. I hope he will take warning before it is too late. it gives me great satisfaction to learn that he has past through the university with so much reputation, and that his fellow Students are attached to him. I have never once regreeted the resolution he took of quitting Europe, and placing himself upon the Theatre of his own Country, where if his Life is spaired, I presume he will neither be an Idle or a useless Spectator. Heaven grant that he may not have more distressing scenes before him, and a Gloomier stage to tread than those on which his Father has acted for 12 years past, but the curtain rises before him, and instead of peace waving her olive branch, or Liberty seated in a triumphal car or commerce Agriculture and plenty pouring forth their Stores, Sedition hisses Treason roars, Rebellion Nashes his Teeth. Mercy Suspends the justly merited blow, but justice Striks the Guilty victim. here may the Scene close and brighter prospects open before us in future. I hope the political machine will move with more safety and security this year than the last, and that the New Head may be endowed with wisdom sufficient to direct it. there are Some good Spokes in the Wheels, tho the Master workmen have been unskilfull in discarding some of the best, and chusing others not sufficiently Seasond, but the crooked & cross graind will soon break to peices, tho this may do much mischief in the midst of a journey, and shatter the vehicle, yet an other year may repair the Damages, but to quit Allegory, or you will think I have been reading Johnny Bunyan. Abigail ends by noting that she is sending tea urns to each of her sisters with instructions for their use and commenting on the high prices of goods in England. Read about the Harvard commencement in the next posts. The letter can be found at Founding Families: Digital Editions of the Papers of the Winthrops and the Adamses, ed.C. James Taylor. Boston: Massachusetts Historical Society, 2016. The portrait of JQA at age 29 is by John Singleton Copley; it is at the Museum of Fine Arts in Boston. Our next movement was to Kingsbridge. . . . the chief resort of the Cranch family. We arrived at the inn about six o’clock on Saturday evening. About eight, we were saluted with a ringing of bells, a circumstance we little expected. Very soon we were visited by the various branches of the Cranch family, both male and female, amounting to fifteen persons ; but, as they made a strange jumble in my head, I persuaded my fellow traveller to make me out a genealogical table, which I send you. Mr. and Mrs. Burnell, and Mr. and Mrs. Trathan, both offered us beds and accommodations at their houses; but we were too numerous to accept their kind invitations, though we engaged ourselves to dine with Mr. Burnell, and to drink tea with Mr. Trathan, the next dav. Mrs. Burnell has a strong resemblance to Mrs. Palmer. She is a genteel woman, and easy and polite. We dined at a very pretty dinner, and after meeting drank tea at the other house, Mr. Trathan’s. Their houses are very small, but every thing neat and comfortable. Mr. Burnell is a shoemaker, worth five thousand pounds; and Mr. Trathan a grocer, in good circumstances. The rest of the families joined us at the two houses. They are all serious, industrious, good people, amongst whom the greatest family harmony appears to subsist. The people of this county appear more like our New England people than any I have met with in this country before; but the distinction between tradesmen and gentry, as they are termed, is widely different from that distinction in our country. With us, in point of education and manners, the learned professions, and many merchants, farmers and tradesmen, are upon an equality with the gentry of this country. It would be degrading to compare them with many of the nobility here. As to the ladies of this country, their manners appear to be totally depraved. It is in the middle ranks of society, that virtue and morality are yet to be found. Nothing does more injury to the female character than frequenting public places; and the rage which prevails now for the watering-places, and the increased number of them, are become a national evil, as they promote and encourage dissipation, mix all characters promiscuously, and are the resort of the most unprincipled female characters, who are not ashamed to show their faces wherever men dare to go. Modesty and diffidence are called ill-breeding and ignorance of the world; an impudent stare is substituted in lieu of that modest deportment, and that retiring grace, which awes whilst it enchants. I have never seen a female model here of such unaffected, modest, and sweetly amiable manners as Mrs. Guild, Mrs. Russell, and many other American females exhibit. Abigail’s letter is from the volume Letters of Mrs. Adams, The Wife of John Adams With an Introductory Memoir by Her Grandson, Charles Francis Adams, Volume II, 1840. When John and ABIGAIL ADAMS were in London—John being the American minister to England from 1785 to 1788—they lived at 9 Grosvenor Square. As an expat in London I visited the site which is on the northeast corner at the intersection of Duke Street and Brook Street. A plaque, placed by the Colonial Dames of America in 1933, includes the information that the Adams’s daughter Abigail (Nabby) was married there to William Stevens Smith. In 1787 Abigail and John decided to see some of England outside London before they departed. They set out on a journey to the West Country; Abigail recounted some of her observations and experiences in a letter to her sister Mary Cranch. When I wrote you last, I was just going to set out on a journey to the West of England. I promised you to visit Mr. Cranch’s friends and relatives. This we did, as I shall relate to you. We were absent a month, and made a tour of about six hundred miles. The first place we made any stay at was Winchester. There was formerly an Earl of Winchester, by the name of Saer de Quincy. He was created Earl of Winchester by King John, in 1224, and signed Magna Charta, which I have seen; the original being now in the British Museum, with his handwriting to it. After conveying some information to her sister about the Cranch ancestry Abigail expressed curiosity about her family, the Quincys. I have a perfect remembrance of a parchment in our grandmother’s possession, which, when quite a child, I used to amuse myself with. This was a genealogical table, which gave the descent of the family from the time of William the Conqueror. This parchment Mr. Edmund Quincy borrowed, on some occasion, and I have often heard our grandmother say, with some anger, that she could never recover it. As the old gentleman is still living, I wish Mr. Cranch would question him about it, and know what hands it went into, and whether there is any probability of its ever being recovered; and be so good as to ask uncle Quincy how our grandfather came by it, and from whence our great-grandfather came, where he first settled, and take down in writing all you can learn from him and Mr. Edmund Quincy respecting the family. You will smile at my zeal, perhaps, on this occasion; but can it be wondered at that I should wish to trace an ancestor amongst the signers of Magna Charta? Amongst those who voted against receiving an explanatory charter in the Massachusetts, stands the name of our venerable grandfather, accompanied with only one other; this the journals of the House will show, to his immortal honor. I do not expect either titles or estate from the recovery of the genealogical table, were there any probability of obtaining it. Yet, if I was in possession of it, money should not purchase it from me. But to return to Winchester. It is a very ancient place, and was formerly the residence of the Saxon and Norman kings. There still remains a very famous cathedral church, in the true Gothic architecture, being partly built in the year 1079. I attended divine service there, but was much more entertained with the venerable and majestic appearance of the ancient pile, than with the modern, flimsy discourse of the preacher. A meaner performance I do not recollect to have heard; but, in a church which would hold several thousands, it might truly be said, two or three were met together, and those appeared to be the lower order of the people. Abigail’s letter is from the volume Letters of Mrs. Adams, The Wife of John Adams With an Introductory Memoir by Her Grandson, Charles Francis Adams, Volume II, 1840. 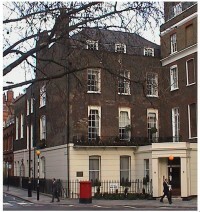 The illustration of the Adams’s Grosvenor Square House is taken from this SITE. 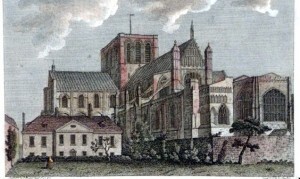 The engraving of Winchester Cathedral can be found HERE.